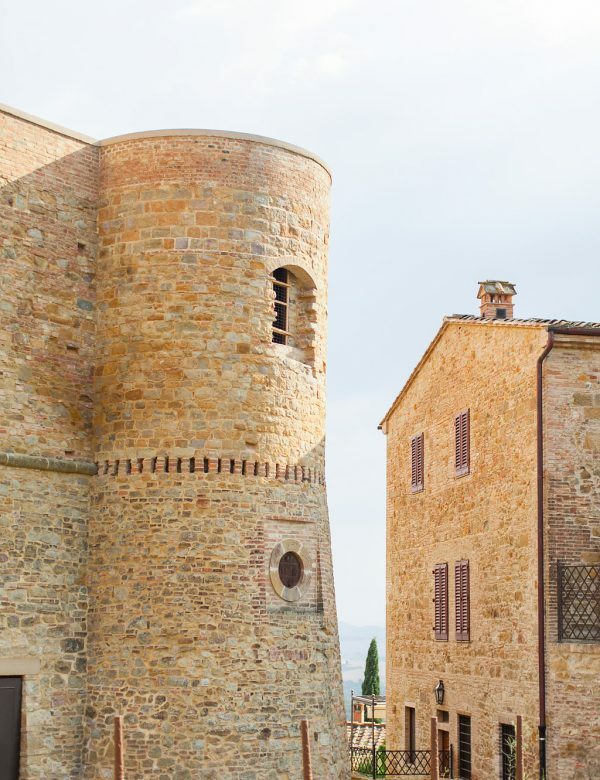 Tuscany is dotted with many a castle, dating from the Early to the Late Middle Ages. These were the centuries of the so-called ‘walled towns’. At the time, the region was not a united country, but a constellation of realms, earldoms and dukedoms, each fighting against neighboring territories to overwhelm them and gain more land and power. The way wars were fought at the time was by continuous siege, and that is why the lords had their principal dwelling built on a hill with strong bulwarks erected to surround them for a constructive defensive system. Tucked into soft rolling hills, today these castles are a much sought-after venue for wedding celebrations (for the castles where civil weddings are allowed), or a sumptuous banquet. If in the past these castles were the seat of the Governor – the common title of the ruler of Medieval towns – today they are the perfect venue for the exchange of promises of eternal love. 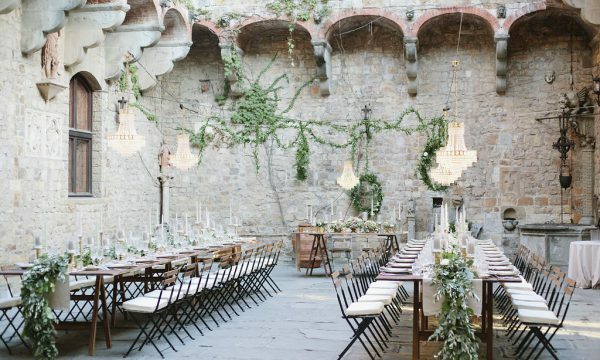 The most austere yet romantic of these castles is Palazzo Pretorio. Soaring in the center of a typical hilltop Medieval walled town overlooking a luxuriant countryside, it offers a wondrous courtyard with a magical wishing well and an impressive stairway. The entire hilltop hamlet is restricted to standard vehicle access and, so, just imagine the arrival of the bride aboard a private luxury car with a driver or an unconventional (and very Italian) three-wheeled Ape Car, or guess what, the funicular! Yes, because the only means of transport to connect the downtown to the uptown is a cabin-car on railway! All of this is so fun and original that many times the entire wedding party is escorted uphill on the funicular. 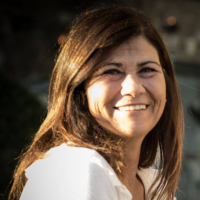 Everyone waits for the arrival of the bride at the end of the railway and lingers in the two aisles along the main road leading to Palazzo Pretorio: two rows of guests applauding the smiling bride who, as tradition wants, arrives last. The Mayor or a member of the city council solemnizes the wedding ceremony, rigorously dressed with the three-color sash representing the flag of Italy. This experience will be unique, a leap back in time, and far from hectic city life. 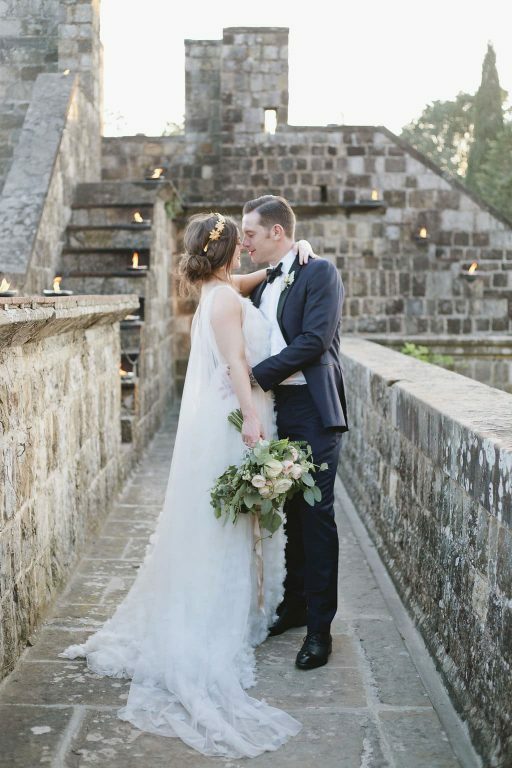 Photo opportunities for the bride and groom and the bridal party in and around the tiny brick-walled streets abound, as do opportunities for astonishing snapshots of the surrounding countryside, lined with olive groves and wheat fields. Not far from the Castle, is the Canonica Park, where a lunar landscape is the backdrop for an unusual scenario. Imagine your delicious lunch on a panoramic terrace overlooking the valley, with its luxuriant vegetation as the icing on the cake of your perfect wedding. Working together with garlands of roses and citrus fruit, and a perfectly planned feast, music is the means to transport your wedding to another level. A string quartet or a classical guitarist, perhaps even in costume, are the well suited musical entertainment that will add to the Medieval flavor of the moment. In Medieval times, minstrels told tales in the form of song. Theirs were tales of true or imaginary events; poems sung accompanied by music and song. They gathered at feasts and festivals in great numbers with harps, fiddles, bagpipes, flutes, flageolets, citterns, and kettledrums. The minstrel was a travelling entertainer who created his own ballads and long poems based on myths and legends. Our collective image of minstrels is of people wearing brightly colored costumes riding on costumed horses from castle to castle, with lutes and harps and bagpipes across their backs. In the tale of Robin Hood, he disguises himself as a minstrel to save a girl from an undesirable marriage to reunite her with her true love. This period in European history is also known as the Dark Ages and, during this time, monasteries cultivated a large part of the floral community, including herbs, fragrant flowers and medicinal plants. There was little emphasis on floral arranging for decorative purposes, as most flowers and herbs were grown for medicinal purposes. Fragrant flowers were used to freshen the air and for use in garlands and wreaths. Illuminated manuscripts show us simple floral bouquets with symbolic flowers. Plant symbolism was of great importance during this time of intense religious fervor. The arrangement of flowers was casual, an example of which we see in the Portinari Altarpiece by Hugo van der Goes, with vegetation placed in simple containers like jugs, bottles, and glass and majolica tumblers. 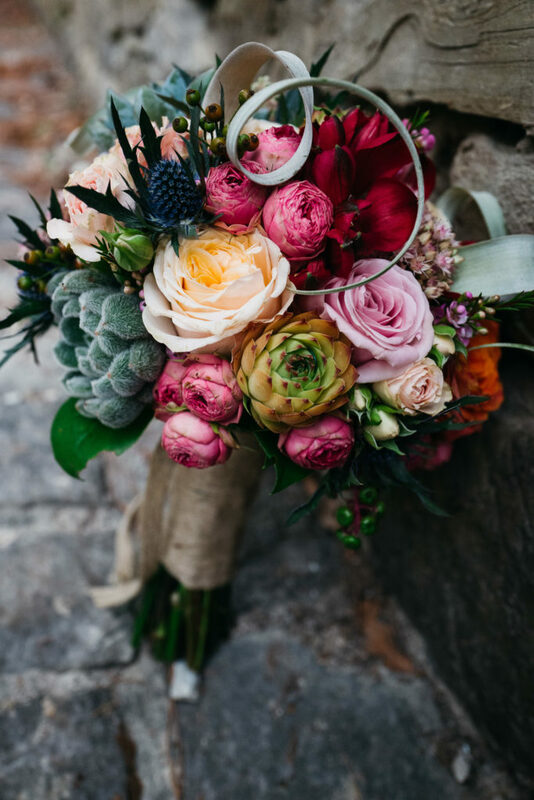 Floral arrangements have evolved over time and the availability of flowers and vegetation from all over the world can lend to marvelous additions to any wedding. Also popular during this period were spiral garlands made with foliage and tiny flowers. Narrow bands of alternating fruit and flowers, especially roses, were worn in pageants, festivals, and at weddings. This custom is echoed in folk festivals throughout Europe where everything is decked with chains of flowers, animals and people alike, as participants in a garland dance. The floral arrangements that we see in tapestries of the time are characterized by a minimal number of flowers, in reference to their scarce availability. Fragrant herbs like garlic and abundant grains like sheaves of wheat were common symbols in weddings, along with floral garlands worn by both bride and groom. Beginning in about 1400, floral design began flourishing in Italy with a renewed interest in knowledge, beauty and classical art and floral arrangements consisted of colorful flowers, fruits and vegetables. Simple containers like jugs, bowls and urns were still used to arrange flowers associated with religion, like the Lily of the Valley. 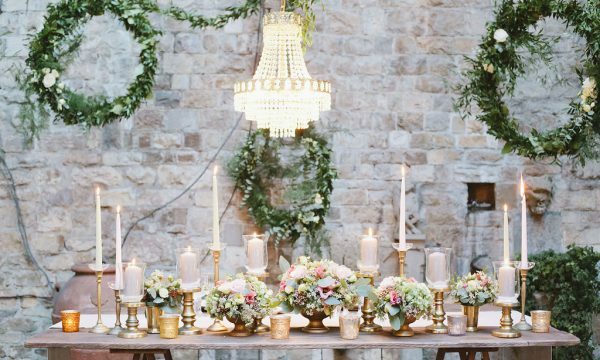 A castle wedding, though, might be an invitation to return to the origins of Medieval times with a clutch of local seasonal flowers and herbs, like rosemary and thyme, and a garland laced into the bride’s hair.